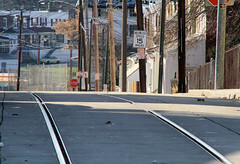 UrBanPerspectiV BLOG: Where'd the tracks go? I like this optical illusion. I originally shot some long depth of field (LDoF) of the tracks, but I think this was the more compelling image. "We're" looking at a hill. You can see the houses and school buses in the background at the bottom of the "hill" (of course you'll have to click on the image to see the larger versions or to view it on a black background.